Printed By J. E. Jenkins, Auckland. 20pp promotional programme for Louis Armstrong's only tour of New Zealand. He performed at the Founders Theatre in Hamilton on March 20th, 1963. This brochure is titled "Harry M. Miller presents Louis Armstrong" on front cover. 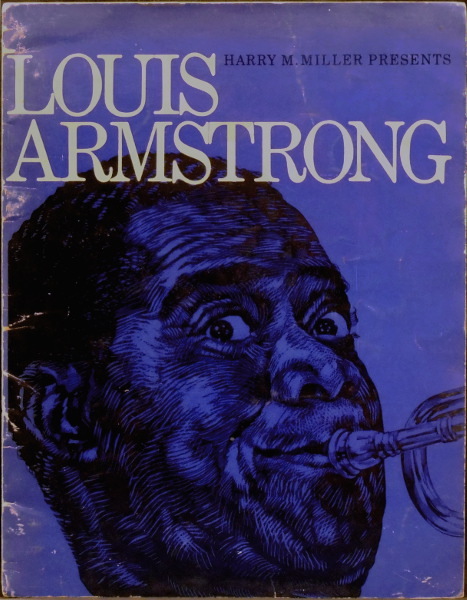 On the first page is "Louis Armstrong and his All Stars with Jewel Brown and Eddie Cano" alongside a photo of Louis Armstrong. Armstrong has signed this page. The brochure also has a biography of Armstrong and many iconic photographs. It also includes information about Jewel Brown, The All Stars, Eddie Cano, Lucille Armstrong and advertisements. The Programme/brochure is in very tidy condition with some creasing and fading to the covers.